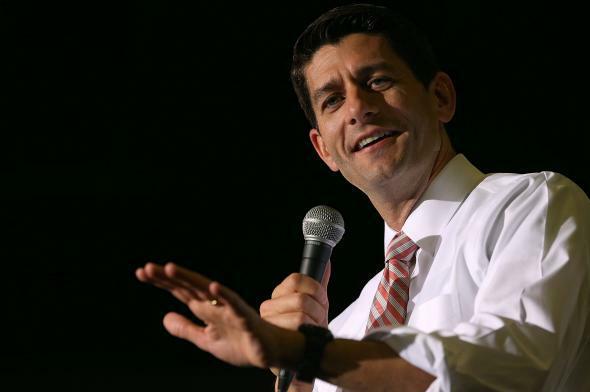 House Freedom Caucus supermajority votes for Paul Ryan for speaker. U.S. Rep. Paul Ryan at a campaign rally in Fredericksburg, Virginia. Paul Ryan’s path to becoming Speaker of the House got a little clearer on Wednesday night when a majority of the hard-line conservative House Freedom Caucus voted to support Ryan’s candidacy for the post. As evidence of the lingering doubts among the party’s staunchest conservatives about Ryan, the vote fell short of the support needed—a four-fifths majority—to garner the 40-member group’s official endorsement. “While no consensus exists among members of the House Freedom Caucus regarding Chairman Ryan’s preconditions for serving, we believe that these issues can be resolved within our Conference in due time,” the Freedom Caucus said in a statement Wednesday night. What remains unclear is whether that outcome is considered sufficient allegiance to the former vice presidential candidate to fulfill Ryan’s demand that the far right of the party rally behind him or he walks. The New York Times says the vote “effectively deliver[s] the Republican Party unity that he had sought as a condition for accepting the post.” The Washington Post isn’t so sure: “it was not immediately clear whether that support—which fell short of a formal endorsement—would meet the most challenging condition Ryan set out Tuesday for serving as speaker …” Ryan responded to the day’s detente with this statement Wednesday night. While the Freedom Caucus vote doesn’t qualify as a full embrace of Ryan, “the support represents the first thaw in the increasingly frosty relationship between tea party conservatives and establishment Republicans,” the Washington Post notes. Ryan met with members of the caucus on Wednesday after signaling his willingness to take on the speaker role if the party’s warring factions could come together to unanimously back him. The central lingering sticking point—though not the only one—is Ryan’s demand of a rule change making it harder for the House members to remove the speaker. For Ryan, it’s integral for his accepting the job and a prerequisite to returning some semblance of functionality to the House of Representatives. The hard-line conservative House Republicans have used the rule, which requires a simple majority to depose the speaker at any time, as leverage to hold hostage legislation not to their liking.